In my work as a Google Partner and AdWords consultant I work with a lot of clients whose business models depend on getting a steady supply of leads for new business. In fact, most of my AdWords clients use AdWords primarily for lead generation, and most of their business models rely so heavily on continual lead generation that they would go out of business if they didn’t keep getting new leads all the time. Lead generation is a fundamental and essential part of many of my clients’ business models, including mine. One industry where I’ve managed a lot of AdWords campaigns with the goal of getting leads is the legal industry, and specifically for injury attorneys. Injury lawyers depend heavily on leads, because those leads turn into new clients and any one legal injury client has the potential to be very lucrative for an injury lawyer. 1. Injury lawyers have to have a continual supply of new leads. Having a continual supply of new client leads is absolutely essential for any injury law firm to be able to stay in business. When you practice injury law, you have to get new clients in order to make money and pay the bills, and to get those new clients you have to have a continual supply of new leads. If the leads dry up, the new clients dry up, and when the clients are gone, the money is gone and you’re out of business. So having a continual supply of new leads and getting clients is a requirement for any injury law firm. You have to continually get leads and new clients to stay in business. 2. One new client is very valuable. The nice thing about the injury law niche is that one new client can be extremely valuable. I work with a lot of moving companies, and when a moving company gets a lead and turns that lead into a new customer it can be worth anywhere between a couple hundred dollars of a few thousand dollars for the moving company. But for an injury lawyer, one lead that turns into one new client can be worth anywhere from a few thousand dollars to literally millions of dollars and a life-changing case. One thing that being an injury attorney has going for it in relation to lead generation is the fact that one new client can be extremely valuable. It literally can mean millions of dollars via a contingency fee. It can be life changing money. So personal injury leads are very valuable, and getting them is very important. Since injury leads are so valuable, it’s important that as an injury lawyer you figure out how to get those leads, and how to get a lot of them. 3. No matter how you get the leads, you’re going to have to pay up for them. As an injury lawyer you are surely aware of how important and valuable personal injury leads are. But guess what, everyone knows how valuable those leads are, and one way or another, you’re going to have to pay-up to get those leads. Nothing in life is free, including personal injury leads. You can try and get injury leads from billboards, or television ads, or radio ads, but those marketing channels all cost a lot of money. Or you can rely on other lawyers to refer clients to you, but as I’m sure you know, those referrals don’t come cheap. And if you run a law firm you can rely on “rainmaker” partners to bring in new business, but of course they don’t work for free. And finally, you can get legal leads through online marketing channels (which we’ll discuss in detail below), and that kind of marketing cost money too. To summarize, we know three things about injury leads: injury attorneys can’t live without them, one new client is very valuable, and no matter how you get them, you’re going to have to pay-up for injury leads. Now that we’ve established some facts about lead generation in the injury law niche, let’s look at the most effective way that injury attorneys can keep a steady supply of leads coming in, month after month. 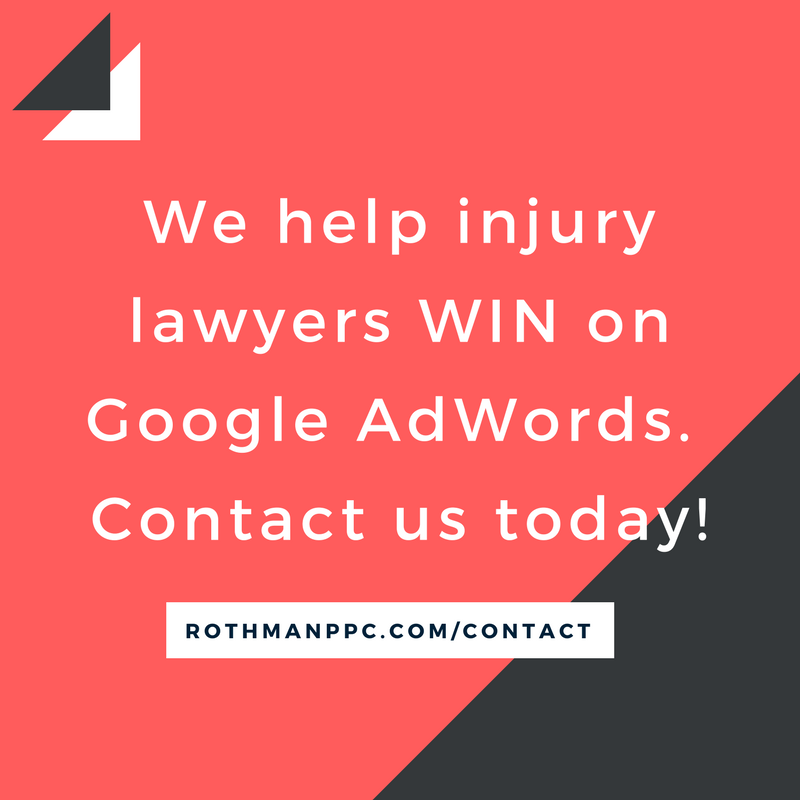 The number one way for injury lawyers to get leads is by using Google AdWords to advertise on relevant Google searches. When people need a personal injury lawyer, they don’t open the phone book that they don’t own, they don’t watch television for commercials that they fast forward through, and they don’t remember the phone number on the billboard that they saw three months ago. They don’t do any of those outdated, no-longer-relevant activities. Instead, they go to Google.com and search for a lawyer. The number one way people look for lawyers now is through Google. So as an injury lawyer who wants leads and clients, you have to go to where the clients are looking for a lawyer, and these days people look for lawyers on Google. So you have to be on Google if you want to get personal injury leads. And there are two ways to get on Google, through advertising and through organic search results. You want to be on both the advertising results and the organic results. 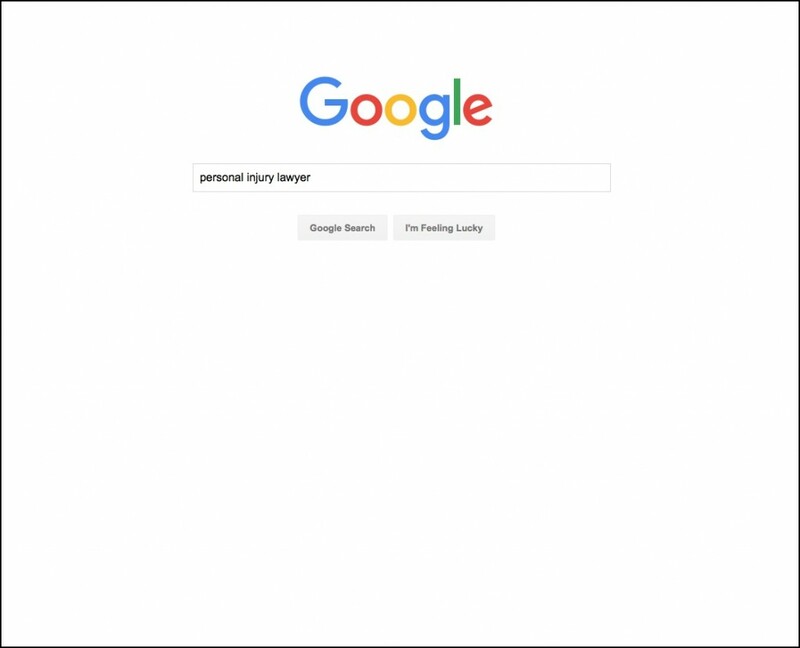 To get the most leads possible, you want to be on both the advertising section and the organic section of the Google search results when someone searches for an injury lawyer. 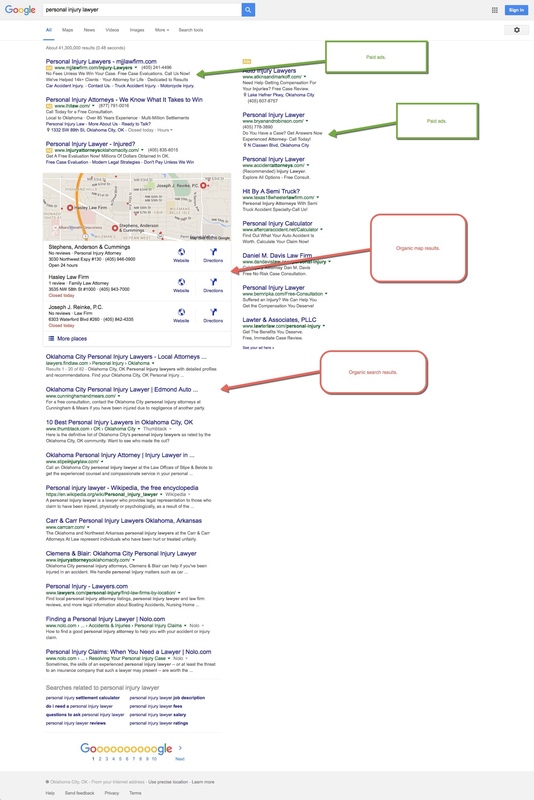 This article focuses on placing ads on the Google search results with Google AdWords. Google AdWords is hands-down the best way for any business to get leads, including an injury law firm. With Google ads, you get to get in front of people who are searching for exactly what you offer at the exact time that they’re looking for it. How you can you beat that? You can’t. Google is the most effective form of advertising and every personal injury lawyer should be using it to get new leads. Let’s cover a few things you should know about using Google AdWords. AdWords is a beautiful system because you get to put your ads in front of people in your target location who are searching for exactly what you offer at the exact time they’re looking for it. And you only have to pay Google when someone clicks on your ad and goes to your website. Hands down, it is the most effective form of marketing in the world. What the actual cost per clicks ends up being for each click depends on the relevance of your ads and landing pages and also how much you and other competitors are willing to bid, as Google AdWords is a modified auction system. In AdWords, you and your competitors will both set your maximum cost per click, which is how much you’re willing to bid for each click. If you bid $10 and your competitors bids $9, then your ad will show up higher. But it’s not that simple. I called the AdWord bidding system a modified auction system because Google also mixes in a relevance factor, via a keyword quality score (a relevance score you get on each keyword that ranges from 1 to 10, with 10 being the best score). So if your ads and landing pages are more relevant to the search user’s query, then you won’t have to bid as much as your less-relevant competitors to show up higher than them. You and a competitor, we’ll call him the Loser Lawyer, are both bidding on the keyword “personal injury lawyer.” You set your maximum cost per click bid at $7 and your competitors sets his maximum cost per click bid at $10. So your competitor is willing to pay more for each click, and if relevance was equal his ads would show up higher. However, you have hired Rothman PPC and through my advanced AdWords management work, I was able to make your ads more relevant than the Loser Lawyer’s ads. We have a quality score of 9 on the “personal injury lawyer” keyword, and the loser lawyer has a quality score of 5 on that keyword. The “Ad Rank” score determines whose ads show up higher, as the ad with the highest Ad Rank score will show up higher. Ad Rank is made up of your maximum cost per click bid multiplied by your keyword quality score. So we have an Ad Rank score of 63, and the Loser Lawyer has an Ad Rank score of 50. Since our Ad Rank score is higher, our ad will show up higher than the Loser Lawyer’s ad, even though he is willing to bid more on that keyword. I went through that example to show you that the AdWords bidding system is an auction based on the highest bidder, but it is also a modified auction where relevance plays a huge role and if your ads have strong relevance (a high keyword quality score), then you can bid less than your competitors and still get your ads to show up higher. How AdWords bidding works is important for injury lawyers to know because personal injury keywords are expensive. You’re going to have to pay-up to get your ads to show up on personal injury related keywords. Lawyers in every decent sized city in the United States bid very high amounts on personal injury keywords. Cost per clicks for personal injury lawyer keywords can range in the $30 to $80 per click range depending on the city. Lawyers bid up these keywords so high because of the value they can get from one new personal injury client. One new client for a personal injury lawyer literally could mean life changing money if the lawyer is able to win a case for millions of dollars. So since the potential value from one new client is so high in the personal injury space, lawyers are willing to bid very high amounts for clicks from personal injury lawyer searches on Google. So to get clicks on personal injury keywords from Google, you need to be prepared to pay up for those clicks and spend a large monthly budget on AdWords. However, since relevance plays a huge factor in your cost per click, through skilled AdWords management you can get your cost per click as low as possible if you’re able to achieve high keyword quality scores. Since the personal injury lawyer keyword space on Google AdWords is so expensive with $30 to $80 cost per clicks, it is highly recommended that you hire an AdWords pro like myself to manage your AdWords campaigns, or you do some serious studying up and learn the AdWords system inside and out so you don’t waste your considerable budget by making amatuer AdWords mistakes. If you want to hire an AdWords expert to manage your high-budget Google AdWords campaign, I recommend finding a certified Google Partner. Properly running your Google AdWords campaign at an expert level is only half the battle. Once someone clicks on your ad, they go to your website, and that’s when the second half of the battle begins. As Alec Baldwin famously said, coffee is for closers, and once you get a search user to your website, you want to close the deal and get them to pick up the phone and call you or fill out a lead form and give you their contact information. Phone calls and lead form submissions are called “conversions” in the AdWords world. You want the search user to click on your ad and then convert by picking up the phone and calling you or by filling out a lead form. You want to make it as easy as possible for the search user to convert and become a lead for you. To accomplish this, you need a good website or landing page. What makes a good website or landing page? There’s no quick answer to this. I’ve seen good websites and landing pages in many formats and styles. We all know good when we see it and we all know crap when we see it. Make sure you’re sending your AdWords traffic to a good website that makes it easy for them to convert. 1. Don’t hide your phone number. So many lawyers hide their phone number on a separate contact page or in small sized text in the upper corner of the website. Don’t make that stupid mistake. If your goal is to get your website visitors to call you, then make it easy for them to call you. Put your phone number in huge sized text in a very visible part of your website and put a call to action next to the phone number like Call Now & Learn How We Can Help or Call Now & Tell Us About Your Case, etc. 2. Have a mobile optimized website. If you’re going to pay for mobile AdWords traffic, then make sure you’re taking them to a mobile optimized site that is easy to read and navigate on a small mobile phone. 3. Put a simple lead form on all pages. 4. Use pictures of yourself and your office. Nothing is worse than a website for a local business with no pictures of real people or real places. People are hesitant to call a business they find online for the first time or fill out lead form if they don’t know who they’re calling or giving their information to. And a website with no pictures of real people or real places does nothing to generate the trust needed to convince someone to pick up the phone and call or fill out a lead form. On your website make sure you use real pictures of yourself, your partners, your staff, and your offices. Using pictures of real people and real places will help generate trust with your website’s visitors and it will lead to more conversions from your AdWords campaigns. As I mentioned above, the personal injury lawyer cost per clicks are really high, so it’s expensive to run an AdWords campaign for these keywords. Since these keywords are expensive and you’ll be running a large AdWords budget, it is critical that you are able to handle the leads that your AdWords campaigns brings in. You have to be able to service the leads you get in an effective and fast manner. Your secretary has to be able to adequately handle the calls you get from AdWords. Your staff has to be able to quickly (instantly if possible) reach out to the lead form submissions you get. You have to be able to handle the leads that you’re paying for. How do you know if your AdWords campaign is profitable? You focus on your average client value and your cost per acquisition (CPA) cost. The first thing you do is figure out your average client value. What is one client worth to you? If the average fee you get from one case is $15,000, then your average client value is $15,000. Your cost per acquisition cost is how much is costs you to get one new client from AdWords. Say you spend $5,000 a month on AdWords, and for that $5,000 budget you get 100 clicks, and out of every 100 clicks you get 10 leads (phone calls and lead form submissions). If your close rate is 10%, then 10 new leads each month will lead to 1 new client. So in this scenario you would have a cost per acquisition cost of $5,000. It would take you $5,000 worth of AdWords spend to land one new client. In this case, your AdWords campaign would be running profitably since your cost per acquisition cost ($5,000) is less than your average client value ($15,000). With these numbers you would be spending $5,000 on AdWords to get one new client that, on average, brings in a $15,000 fee. So you would be making a $10,000 profit ($15,000 average client value less the $5,000 cost per acquisition) from each client you got from AdWords. This is the way to think about profitability with AdWords. Determine your average client value and make sure that number is higher than your cost per acquisition.